New owners, less employees – what’s happening at The News? 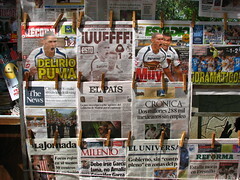 Mexico City – As of June 1st the English language newspaper The News has new owners and changes from a daily publication to a Monday-Friday paper. The news about the restructuring came as a complete surprise to the staff which was reduced to a third of previous size. What’s the news about The News? Previous PostMexico City’s Museums in TroubleNext PostInauguration of Teotihuacán, City of the Gods Exhibition. This is news to me, Ron. If you hear anything else, please let us know. The News has been purchased by the Mac Editorial Group, which owns several other newspapers and magazines in Mexico. They plan to focus more on Mexico news. As Ron mentioned, the sale apparently did come as a big surprise to the newspaper’s staff.